Dave Splash Dot Com: Who Didn't See This One Coming? Bob Novak Leaves CNN...Moves To Fox News! Who Didn't See This One Coming? Bob Novak Leaves CNN...Moves To Fox News! Hmmm...Another Bush toadie at Fox News? How will they find enough time in the day for another pro-Bush infomercial masking itself as political debate? I guess Tucker Carlson, Chris Matthews, and Joe Scarborough are the only Bush lapdogs that haven't moved to GOPTV yet. 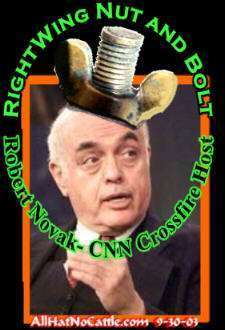 (AP) Commentator Robert Novak, who hasn't been seen on CNN since swearing and storming off the set in August, will leave the network after 25 years and join Fox News Channel as a contributor next month. Novak, 74, said Friday he probably would have left CNN anyway when his contract expired this month even if it hadn't been for the incident. The suspension actually served to eliminate a delicate problem for CNN, which had received some criticism for keeping the political columnist on the air with his involvement in the CIA leak case. A Novak column in July 2003 identified Valerie Plame as a CIA agent eight days after her husband, former U.S. Ambassador Joseph Wilson, accused the Bush administration of manipulating intelligence before the Iraq war. Novak wrote that two administration officials were his sources, but he hasn't identified them and Plame's outing sparked a special prosecutor's investigation. Novak walked off the set in August during a political debate after James Carville said that he's "got to show these right-wingers that he's got a backbone." Novak quickly apologized, but CNN never let him back on the air. A CNN correspondent, Ed Henry, said he had been about to ask Novak on the air about the leak investigation, but Novak said that had nothing to do with why he walked off. "I'm sorry it ended that way but I am confident if it hadn't happened that I would still be leaving CNN," he said. The network has been de-emphasizing political content, and canceled the long-running debate show "Crossfire." Novak said he was the last on-air personality who had appeared on CNN during its first weekend on the air in 1980 to still be with the network. The decision to leave was by mutual consent and there were no hard feelings, he said. "I have no complaints," he said. "I had a 25-year run with CNN. That's longer than most marriages, I think." While his CNN shows included "The Capital Gang," "Inside Politics" and "Evans and Novak," he was best known for the political trench warfare of "Crossfire," where his fiery conservative views led some opponents to give him the nickname the Prince of Darkness. He said he wanted to stay in TV, but do more limited work. Fox News Channel spokesman Brian Lewis confirmed his signing with that network. Novak said the switch to Fox had nothing to do with finding a more comfortable home for his views. "I don't think that's a factor," he said. "In 25 years I was never censored by CNN and I said some fairly outrageous things and some very conservative things. I don't want to give the impression that they were muzzling me and I had to go to a place that wouldn't muzzle me."